Windows 10 forcefully installs Windows Updates by default. This includes all updates including Windows device drivers. 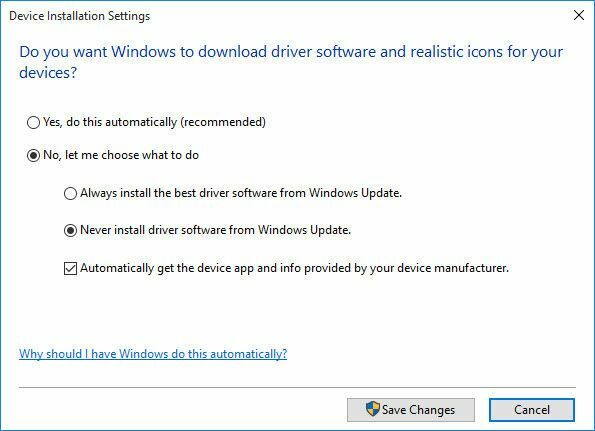 This article is about disabling automatic driver updates from Windows Update. This setting can be disabled due to several reasons. Some drivers from Microsoft may not be fully compatible with the device driver you have installed. Or the driver which the manufacturer provides can have more features than the basic Microsoft drivers. 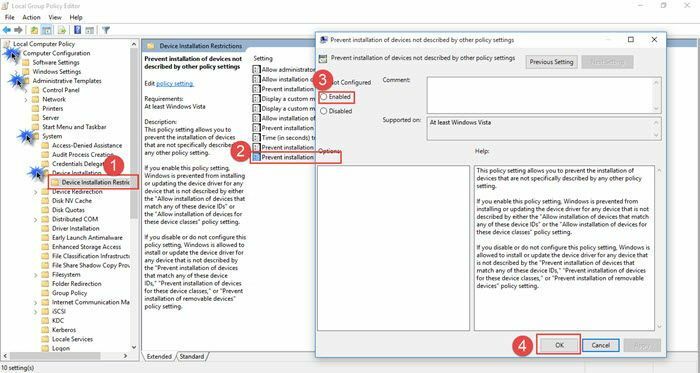 In this article, we will share three different ways to disable automatic driver updates in Windows 10. While the focus and screenshots are from Windows 10, the same configurations can be used for Windows 7, Windows 8 and Windows 8.1. 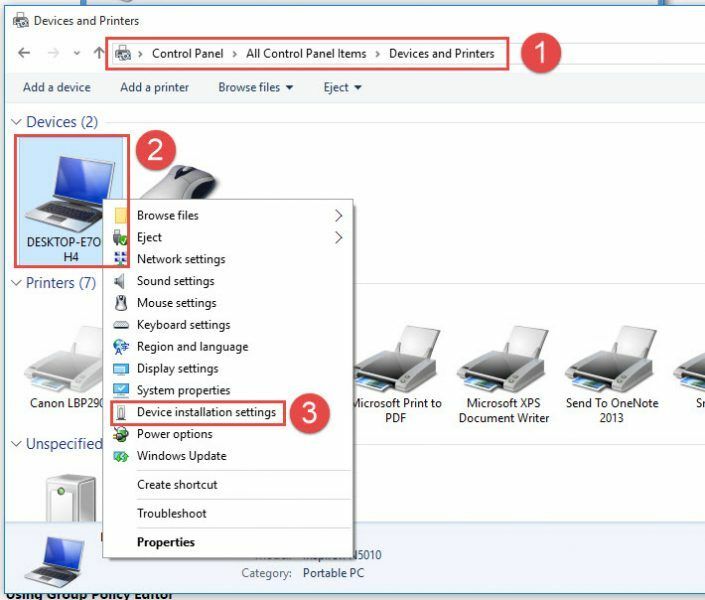 Right click the computer icon under Devices and select “Device installation settings”. Windows will ask you the following question: “Do you want Windows to download driver software and realistic icons for your devices?. You should choose “No, let me choose what to do”. If you want to dig deeper in controlling every aspect of device driver installation through group policy, read this wonderful technet article. You can also disable device driver installation from Windows Update using Windows Registry. It is always recommended to backup your Registry before making changes to the registry. Change the value of “SearchOrderConfig” to 0. While there are quite a few software to detect the unknown devices and automatically download and install their drivers from their respective manufacturers, you can always go to the device manufacturer to download the latest compatible device drivers of your choice. If you don’t want to take headache of finding the right device driver, I would highly recommend 3 DP Chip software which will automatically download the latest compatible device drivers for your basic system devices like motherboard, graphics card, sound card and network drivers. SlimDrivers is another wonderful program which will keep your device drivers updates and the drivers will come from their respective device manufacturers. is this work if using windows 10? windows upgrade assistant always check everything to upgrade. Don’t waste your time on the first method. It does not work. Besides of this, there are another two ways you can do to disable the Windows 10 auto-updates. You can set the metered network connection for your Windows 10 and disable automatic device installation. There’s no longer a “sub section”. And it never says “drivers”. They are now called “manufacturer apps” and “icons”. *PLEASE* update this old article. The actual registry value name is “SearchOrderConfig” not “ChangeOrderConfig”. Thanks a lot for pointing out. I have corrected the value to SearchOrderConfig in the article. 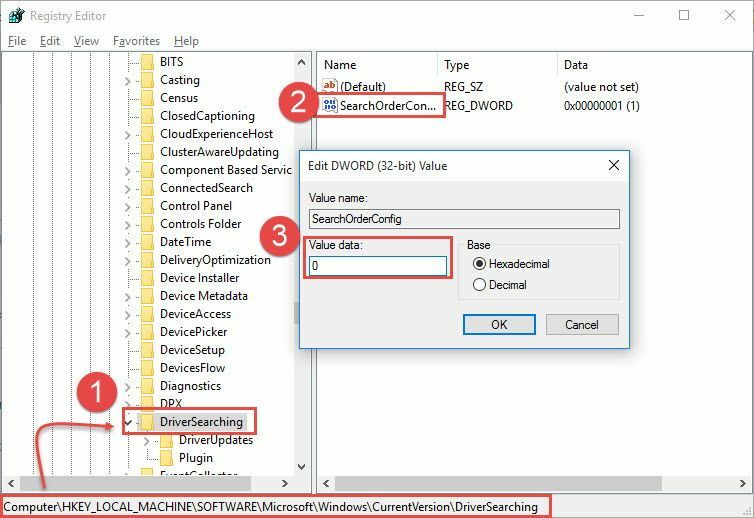 According to https://social.technet.microsoft.com/Forums/windows/en-US/10bf1813-4c28-4bc7-87d2-5cb200183e22/could-not-turn-off-the-driver-software-download-settings-using-registry-value-driversearching?forum=win10itprogeneral and https://superuser.com/questions/541826/registry-key-setting-to-enable-windows-to-download-driver-from-windows-update the value for the registry key “SearchOrderConfig” to disable automatic updates is 3 not 0. For me I can set option one but that alone will not stop auto updating. I don’t have goes it available as running Home version. So I must also set registry key. Also, every time there is a major Windows update I must change all this manually again. Very painful because my computer auto shuts down with the display driver the OS tries to force on it. In method #1… there’s no longer the sub-choices option. This site is very good. It saying about a few software which detect the other devices and drivers. It says about slim driver software. Which update device drivers. Thanking you.